I may have seen you a few years ago in the months before you left for war, walking with a child in your arms or crowded into a small fast car with others like you, music blaring, tattoos fresh. I may see you this week as we both wait for our food orders at the local Baja Fresh. I have probably been close enough to shake your hand but I never have. I see your face reflected in the photographs lined up in the obituary pages of our newspaper each week. I see your eyes looking out of each one but you remain unknown to me. I may have seen your mother’s face yesterday in the grocery store as she shopped for one less mouth to feed at the family gathering, or your sister’s face when she placed a vase of flowers at your grave in the national cemetery near my home. I saw them but never knew. When I was a 21-year-old newspaper reporter, my first job assignment was to cover the Memorial Day Parade in Rockport, Massachusetts. I snapped photographs of men with creased faces in uniforms brushed clean as they placed wreaths, spoke words and then went silent as they remembered you. I saw all this too and could not know what was in their memories or their hearts. I can never know. I only know a life that comes with never having had to face the choices you have made or that were made for you. It has been all too easy not to know you. I have lived all my life behind the shield created for me by my age, luck, family, timing, the country into which I was born. 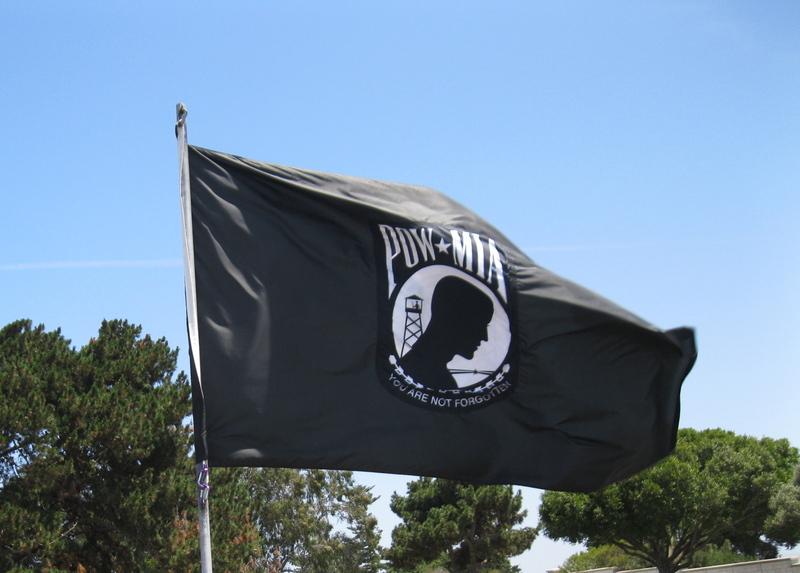 In this country now, there are those who go to war and those who can remain behind. Those who know what it costs and those of us who believe we know, who try to imagine but can’t. We’ve never been there. We’ve never lost a child or a husband or a mother or a sister or a brother or a friend to enemy fire. There are those who, inspired by attacks like the ones on 9/11, rushed to join and to help and put their lives at risk. There are those of us who, made afraid by these same attacks, let you. We asked it, maybe not out loud but with our actions, or our inaction. In every generation, in every country of the world, there have been people like you and people like me. There have been warriors who die instantly from their wounds on the battlefield and those who die years later of injuries no one can see or understand. There have been families who have had to face sudden and devastating loss and those who witness the loss of their loved one as it plays out over months and years. There are those who never know what happened to the ones they have lost. And then there are people like me who lose sight of all these casualties simply because we can. We can lose ourselves in our dreams, our plans, in Memorial Day sales, and food and in the families who have not been altered forever by war. 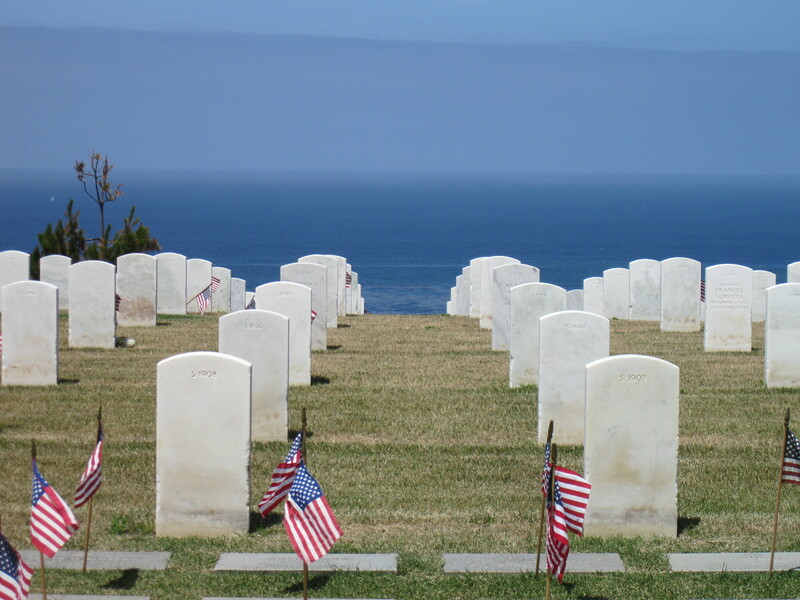 I learned this week that a moment of silence has long been part of a the right way to observe Memorial Day. At 3 p.m., all across the country, people will be silent and will acknowledge you and honor you or simply fall silent and let themselves feel that your death is our loss. Today, at 3 p.m. Pacific time, I will be thinking of you and I will be thinking of those you faced and fought who have also suffered and died. I still won’t know you but I will wish I had. And I hope that taking that moment will lead me to a deeper acknowledgment of what I ask of you and to give more to you and to those who love you. 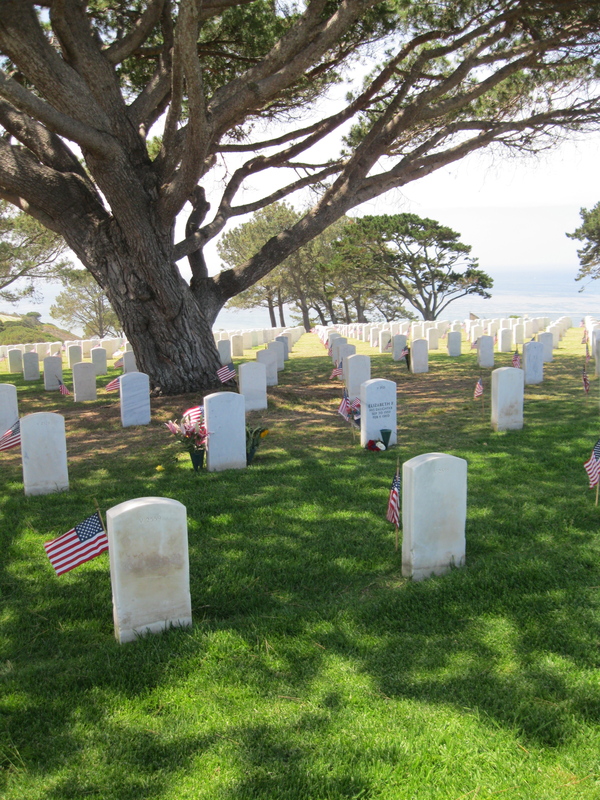 The photos above were taken yesterday at Fort Rosecrans National Cemetery in San Diego where thousands of military men and women and their families have been buried for more than a hundred years. Thank you for writing this. Through these words you not only honor Veterans, but ask us all to open our eyes a little more to those around us who live with the consequences of a family member in the military. It also asks us to understand the choices some are able to make for not joining the military, and more fully respect the committment and sacrifices of those who do serve as well as their families. Thank you, also, for putting yourself “out there” in your blog. Your gift of expression gives words to feelings we might not otherwise identify, as well as suggests we open ourselves more to those feelings. Elizabeth, This is an old post so I don’t even know if you’ll see this comment. I just read your Day of the Dead post. Hopped here from there. First I would like to say I love your blog. I tend to forget about it until something pops up in my email, then I’m drawn back in with your words. In this post you mentioned the “men with creased faces in uniforms brushed clean.” I thought immediately of my father who is nearly 4 years gone now. He died at 93 small and frail. But I saw him one day, at the local Veterans’ Wall stand straight and tall as if called to attention by a brigade commander 70 years before. I plan to write my own Veteran’s Day post this year (on a blog I haven’t touched in months) about a young man I have never met, but who, unexpectedly. has become the face of all the soldiers you wrote about. You see I make memory bears. They can be made of anything, but usually I use the clothes of a deceased love one. Sgt. Perrott’s sister contacted me and asked me to make some bears from his camo pants. He was killed in action 7 years ago. As I took apart the pants, I discovered cigarette butts in the pockets. It’s kind of weird or woowoo that those butts seemed to bring home the truth of war. Of life, really. Okay, I’ve gone on and on and I really wanted to do was say I related very much to this post and enjoy each one you write. Thank you.